Lowdown: An exposition to the Halo story. Almost ten years ago, Halo provided our household with a revolutionary experience. It was the game bundled with our brand new Xbox console, and for a few straight weeks my wife and I fought through its campaign mode cooperatively. It was one of those gaming memories to cherish for life, a type of a once in a lifetime experience. No game since had managed to get my wife to play with me as much as Halo did (probably because local co-op is virtually extinct nowadays). Since then we had the pleasure of becoming disappointed with Halo 2, and later we dumped our Xbox in favor of a PS3. With the recent release of Halo 4, a game I'd love to play but can't, Halo was brought back to our consciousness. Together with this release came Forward Unto Dawn, a film very well tied to the game. Since I can't play the game I thought watching the film is the least I could do. After an obligatory introduction, Halo 4: Forward Unto Dawn takes us on a flashback to some sort of a space academy for upper class space marines. There we meet a group of teens practicing to become warriors. We see them training in catch the flag tournaments with rival units (hey, just like they do in Halo!) and we get to superficially get to know a group of them. We also learn about the world they live in, some future in which humanity is divided into two factions that are locked in a forever war with one another. 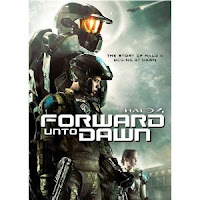 This half of Forward Unto Dawn feels a lot like Starship Troopers (the film, not the book). Then, before we arrive into any sort of a resolution with that Starship Troopers theme, Forward Unto Dawn changes from top to bottom. The Covenant arrives, and attacks our heroes' academy big time. It looks like it would take some sort of a superhero to save the day. Now, imagine who could that be! 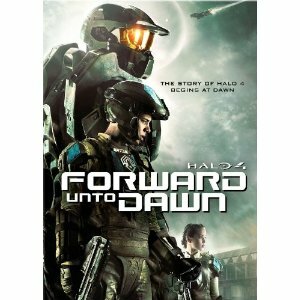 If the first half gave a nod to Halo's multiplayer mode, Forward Unto Dawn's second half goes out to try and enliven the single player campaign. And liven it up it does: in contrast to my expectations, this one is a live action film where the only animation comes from the often crude CGI. Does the package work? Yes and no. Yes, because it is a fine tag along-feature to the game. But no, because it is a film that doesn't know what it is trying to say whose ending feels stuck on with very poor quality glue. Overall: A mediocre film, a nice supplement to the game. 2.5 out of 5 stars.